2018 was an interesting year, caring for and playing with a wide variety of pets throughout California and Washington. Beloved pets are an extension of family and entrusted with their care, I have walked hundreds of miles, thrown a million balls, and petted and comforted so many of these loving creatures. Your home and pets deserve the care and protection of a dedicated, reliable and qualified pet sitter. Staying home in their own environments, with predictable routines are key to their well-being. Having me at your home, to care for them and your household, gives you peace of mind and allows you to enjoy your trip without worry, assured they are in experienced, capable hands, well cared-for and loved as if they were my own. You’ll find my competitive pet-sitting fees outlined below. I hope to have the pleasure of serving you. 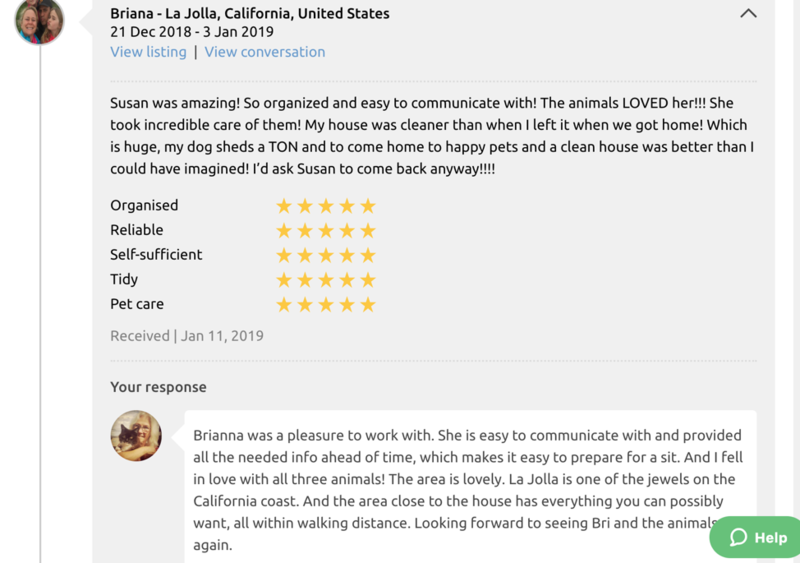 You’ll experience the same professional, great service my recommendations and reviews attest to, taking care of your pets and your home, all at a cost significantly lower than kenneling your furry family. To whom it may concern: For many years Stocklands Farm was, according to Trip Advisor, the top performing Bed and Breakfast in the Midlands area of KwaZulu Natal of South Africa. We were four star graded with a large percentage of returning guests. It was very important to us that standards were maintained while we were away. During this time we were fortunate to have Susan Colby step in and run the operation for us while we were away on leave. She assisted our staff in keeping the operation running smoothly, interacted with our guests – both local and international – and took care of our pets. When we got home we had nothing but positive comments from staff and guests alike. I therefore have no hesitation in recommending her as someone that would take excellent care of your home and/or business while you are away on holiday. Susan did a wonderful job of taking care of our home and our dog while we were gone. It's easy to see that she loves animals -- she made friends with our dog (a Rottweiler mix) the moment she stepped in the door. She took him for long daily walks and when we came home, he was sad to see her leave. As for the house, Susan kept everything inside the house clean and neat, and watered the multitude of plants we have outside. Because she has been a homeowner herself, she's knowledgeable about making sure the home is maintained the way it should be. Susan is a lovely, honest person we would happily hire again. Susan Colby has been a house sitter for us for a number of years. She is reliable, honest and our cats were as calm as if we were there. Also, our house was immaculate when we returned. I would recommend her to anyone! Good Day, Susan has been a house sitter for us numerous times over the past few years. We have always found her to be 100% reliable. Susan has looked after our menagerie of cats, ducks, chickens and fish with great care and loving attention, very important for us, allowing us to go away and enjoy our holidays, knowing that they are all well looked after and content. I can certainly recommend Susan as a reliable and conscientious house sitter. I would highly recommend Susan Colby as a house and pet sitter. We look forward to her sitting with us again in the near future. If you have any questions, please feel free to email me.